A Abdou, M Elwahed Mohammed. Ischemic fasciitis: Unusual Location And Presentation. The Internet Journal of Pathology. 2007 Volume 7 Number 1. We present a case of ischemic fasciitis in a 45 year-old female with unusual site and history. She presented with a hard, infiltrating mass in the anterior axillary fold after a history of modified radical mastectomy and completion of chemotherapy and radiotherapy courses. The clinical presentation led to a possible diagnosis of recurrent breast carcinoma or even sarcoma. However, the microscopic picture was typical of Ischemic fasciitis by its characteristic central necrosis, vascular and fibroblastic proliferation, in addition to the presence of ganglion-like cells, inflammatory cells and hemosiderin granules. Ischemic fasciitis should be considered in the differential diagnosis of anterior chest wall masses and it could be induced by previous surgical trauma. Ischemic fasciitis is a type of reparative or regenerative response to some sort of ischemia especially in elderly patients who are usually debilitated, immobilized or bed ridden (1). It belongs to a group of pseudosarcomatous lesions that include nodular fasciitis, proliferative fasciitis and proliferative myositis (2). These soft tissue lesions are fascia-based fibroblastic and myofibroblastic proliferation that are liable to be overdiagnosed as sarcoma either clinically, cytologically or even histologically (2, 3). A 45 year-old female presented with a left anterior axillary fold mass fixed to the anterior chest wall. This lesion was preceded few months by a high-grade invasive duct breast carcinoma (T2N1M0) that necessitated surgical intervention (modified radial mastectomy) and adjuvant chemo- and radiotherapy. Then the patient shortly developed a new mass in the site of the previous operation that was clinically highly suspicious for malignancy. The mass was respected resulting in a 4x3x1 cm firm lesion with focal brownish discoloration. Microscopically, there was a partly necrotic and hemorrhagic center surrounded by a granulation tissue-like proliferation of capillaries with plump endothelial lining admixed with spindle shaped fibroblasts (figure 1). The lesion exhibited some degree of atypia and frequent mitotic figures (figure 2). 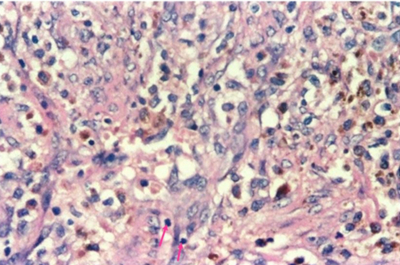 Ganglion-like cells, inflammatory cells and hemosiderin granules were also seen (figure 3). The proliferation diffusely infiltrated the adjacent skeletal muscle. Immunohistochemistry revealed positivity for smooth muscle actin (figure 4) and vimentin and complete negativity for pancytokeratin. 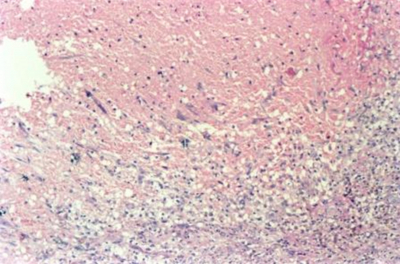 Figure 1: Partly hemorrhagic and necrotic center surrounded by granulation tissue (Hematoxylin and eosin staining, x 200). Figure 2: Proliferating endothelial and fibroblastic cells exhibited some degree of atypia with prominent hemosiderin granules (Hematoxylin and eosin staining, x 400). Figure 3: Scattered ganglion-like cells among the proliferated capillaries and inflammatory cells (arrow)(Hematoxylin and eosin staining, x 400). Figure 4: Strong immunoreactivity for smooth muscle actin in the lesional cells (immunohistochemical staining, x 400). In ischemic fasciitis, females tend to be more affected than males (4). Eighth and ninth decades of life are the peak age (5) however; younger age groups have also been reported (1), also Scanolone et al, 2004 (6) and Yammamato et al, 1998 (7) as their presented cases were 20 and 25 years old respectively. In this study the patient was a 45 year-old female. Ischemic fasciitis has been reported in the deep dermis and subcutaneous tissue of shoulder area, sacrococcygeal region, greater trochanter and chest wall overlying ribs, and vulvogenital region (4, 6). Posterior and lateral chest wall were reported as the main portions for ischemic fasciitis involvement in the chest wall (1, 8). However, anterior chest wall involvement as in our case has not been reported before in the literature. The etiology of most pseudosarcomatous soft tissue lesions is unknown but a preceding trauma is the most accepted offending agent (9). There may be different types of trauma: history of catheterization is considered as the etiology for ossifying fasciitis according to Dogan et al, 2000 (10) and birth trauma for cranial fasciitis according to Hoya et al, 1996 (11). The reported pathogenesis for ischemic fasciitis is related to intermittent ischemia (12) that leads to tissue necrosis and breakdown followed by regenerative and reparative process. This explains the characteristic location of ischemic fasciitis in close apposition to bone, in addition to its origin in debilitated or immobilized patients. However this was not the predisposing fact in our case as the lesion was in the anterior axillary fold and the patient was neither debilitated nor immobilized. Therefore, ischemia does not seem to be the most important factor in this case. Surgical trauma was interpreted to be the cause of postoperative spindle cell nodules that develop in genitourinary tract weeks or months after a surgical procedure (13). Postoperative/posttraumatic spindle cell nodule has also been reported in skin of scalp, face and arm (14). Trauma could be considered as an accepted theory for most pseudosarcomatous lesions including ischemic fasciitis, particularly in the patient here reported. The history of previous operation and radiation, in addition to the clinical presentation of hard infiltrating mass had directed the surgeon to the diagnosis of malignancy. 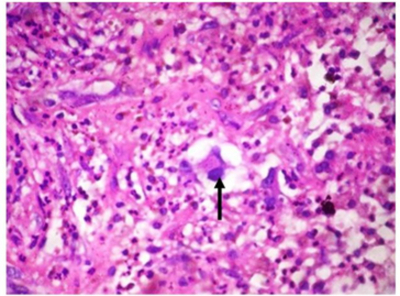 Furthermore, exuberant vascular proliferation, plump endothelial cell lining and the presence of frequent mitoses on histopathologic evaluation had misled to the diagnosis of vascular tumor. However, the presence of central hemorrhagic necrotic core surrounded by radial proliferation of capillaries and fibroblasts, presence of mixed inflammatory cells, ganglion-like cells and absence of abnormal mitoses have emerged the process into some sort of reparative response compatible with ischemic fasciitis (4). 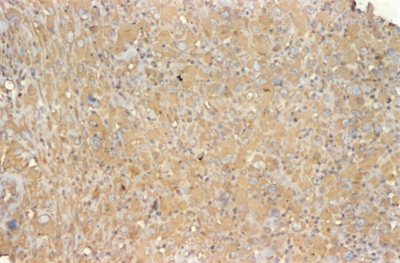 The characteristic immunohistochemical findings pointed to its myofibroblastic nature manifested by positivity for smooth muscle actin and vimentin and complete negativity for pancytokeratin. From this study, ischemic fasciitis as a type of pseudosarcomatous lesion should be considered in the differential diagnosis of anterior chest wall masses after previous surgical trauma. 1. Baldassano MF, Rosenerg AE, Flotte TJ. Atypical decubital fibroplasias: a series of three cases. J Cutan Pathol 1998;25:149-152. 2. Sheikh S, Montogomery E. Fibroblastic lesions. In Montogomery E and Aaron AD. Clinical pathology of soft tissue tumors. Marcel Dekker, New York, USA 2001: 123-163. 3. Kendall BS, Liang CY, Lancaster KJ, et al. Ischemic fasciitis. Report of a case with fine needle aspiration findings. Acta Cytol 1997;41:598-602. 4. Weiss SW, Goldblum JR. Benign fibrous tissue tumors. In Weiss SW and Goldblum JR. Enzinger and Weiss's Soft tissue tumors. Fourth edition Mosby, London 2001: 24-307. 5. Perosio PM, Weiss SW. Ischemic fasciitis: a juxta-skeletal fibroblastic proliferation with a predilection for elderly patients. Mod Pathol 1993;6: 69-72. 6. Scanlon R, Kelehean P, Flannelly G, et al. Ischemic fasciitis: an unusual vulvovaginal spindle cell lesion. Int J Gynecol Pathol 2004;23:65-67. 7. Yamamoto M, Ishida T, Machinami R. Atypical decubital fibroplasia in young patient with melorrhestosis. Pathol Int 1998;48:160-163. 8. Baranzelli MC, Lecomte-Houcke M, De Saint Maur P, et al. Atypical decubitus fibroplasias: a recent entity. Apropos of a case of an adolescent girl. Bull Cancer 1996;83:81-84. 9. Bernstein KE, Lattes R. Nodular (Pseudosarcomatous) fasciitis, a non-recurrent lesion: clinicopathologic study of 134 cases. Cancer 1982;49:1668. 10. Dogan AI, Gedikoglu G, Demircin M, et al. Ossifying fasciitis. Pathol Int 2000;50:153-5. 11. Hoya K, Usui M, Sugiyama y, et al . Cranial fasciitis. Childs Nerv Syst 1996;12:556-558. 12. Fukunaga M. Atypical decubital fibroplasia with unusual histology. APMIS 2001;109:631-635. 13. Huang WL, Ro JY, Grignon DJ, et al. Postoperative spindle cell nodule of the prostate and bladder. J Urol 1990;143:824-826.